Use of Plastic over last two decades has become an essential part of life and no doubt ic contributing to the growth of economy at the cost of environment. While it is hard to imagine life without plastic in the modern world, its impact on damaging the environment, flora and fauna has been raising concern across the world. Plastic is seen in all spheres of life, from bottles of water to polybags to machinery parts; from water and sewage pipe lines and water tanks, to bath tubs, electric fittings, screws, nut-bolts, Information technology among others. Plastic is available in so many variants that it is almost impossible to connect one type of plastic to another. Where on one hand we see the low-density polyethene bags used to carry almost all of our daily shopping products like groceries, on the other hand we have high quality plastic that is used in children’s toys, storage boxes, containers, water bottles etc. At such a time, debate often arises whether plastic should be banned. Ideally, yes, it should be banned but practically, it is simply not that easy. While banning plastics is a boon for the environment, it will be a bane for the economy. It takes 500-1000 years for plastic to decompose and hence it is a permanent pollutant. Plastics are composed of long-chain polymers of carbon and are developed from mostly petroleum products. Decomposition occurs when organisms like bacteria break down a cellular structure and feed on it. But the structure of plastics is not naturally occurring and thus organisms have not yet been evolved to be able to utilise its chemical composition and thus cannot be decomposed naturally. The only method known so far to naturally decompose plastics is to leave it in open sunlight (UV rays). Daniel Burd, a student at Waterloo Collegiate Institute, recently demonstrated that certain types of bacteria can break down plastic. This is a breakthrough if the experiment can be replicated and would solve the problem to a certain extent. Plastic disposal is quite complicated as it cannot decompose and thus is very harmful if disposed off in landfills, where it just lies and fills space that could otherwise be constructively used. If it is left around on soil, it prevents seepage of water into the ground, providing breeding grounds for all sorts of disease-causing germs. If it is disposed off in water bodies, it eventually makes its way into the oceans where it affects the survival of marine organisms. Burning plastics releases toxins which cause air pollution and adds to the already vast amounts of particulates in the atmosphere. Basically, plastics cannot be disposed and need to be recycled. More than one million marine animals and birds are killed annually due to plastic wastes directly or indirectly. When plastics are washed away in oceans and decompose due to direct sunlight into smaller bits, they release toxic chemicals such as bisphenol A (BPA) and PS oligomer which end up in animal guts or ocean shorelines and come in contact with humans and affect their health too. Further, plastics sometimes are directly consumed by fish and other marine animals and these animals either die due to entanglement of plastic components in organs and subsequent organ failures or the plastic ends up in their guts and enters the food chain. Sometimes, the plastics in landfills is consumed by birds and the birds suffer the same fate as fishes. Autopsies of dead fishes and birds have shown all forms of waste material being accumulated in their intestines. Global plastic demand stands in excess of 300 million tons every year. Every where we look, we see plastics. This over reliance on plastics has led to excess of it in dumpsters and landfills. Plastics are used to carry goods, in packaging material, in household products like food containers and water bottles, disposable utensils, electronics casings, insulations and almost everywhere. Plastic pollution is seen in land, water, groundwater as well as in air. When plastics get buried underneath the soil, the groundwater gets affected as plastics release their toxins into the water and this water is then used by humans in households as well as in industries. Water pollution is seen when plastics make their way into water bodies and litter shores and ocean beds and further affect marine life. Plastic disposal in landfills affects the quality of soil due to seepage of toxins into the soil and further prevents water to soak into the soil and prevents replenishment of groundwater. When plastic is burned, toxins are released in the air. Many plastic related toxins have also been found in humans. Polyvinyl chloride, or PVC, is widely known as the most toxic plastic for health and the environment. In its production, it releases dioxins, phthalates, vinyl chloride, ethylene dichloride, lead, cadmium and other toxic chemicals. Further, plastics have been proven to be carcinogenic (cancer causing), mutagenic (mutation inducing) or toxic. The increased number of cancer patients has been attributed in part to the increased use of plastics. Plastic offers a cheap, hassle free and light-weight long duration and air tight packaging. Paper bags and cloth bags cost quite a lot more than plastic bags and are not durable also. Moreover, they are bulky and often unreliable. Especially paper bags and paper packaging can be damaged easily thus compromising the safety of goods being packed. Mostly, companies give away custom made plastic bags that act as brand features with company logos, contact information etc. Printing on pre made plastic bags costs much cheaper compared to cloth bags which need to be custom made. 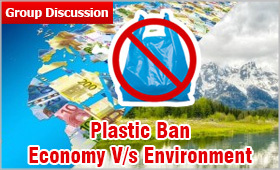 Thus, the ban on plastics will not only affect the plastic industry but other industries as well. When the packaging of products is changed to an expensive alternative, it will naturally affect the price of the product. This will result in a chain reaction of increase in prices of products all over the market and affect customers and businesses alike. The global market for plastic products is growing at about 3% per year, according to the research report by The Business Research Company Plastics Product Manufacturing Global Market 2017. It was worth $1.1 trillion in 2016, and is set to grow to $1.2 trillion by 2020. Banning plastics will bring down a multibillion-dollar industry and thus cause a catastrophic effect on the economy and subsequently the share market. The situation calls for developing a substitute for plastics as pretty much everyone depends on them. Currently, there are two types of bio degradable plastics available. The first is a plant-based hydro-biodegradable plastic known as Polylactic Acid which is formed from corn and degrades within 47 to 90 days. The other type is petroleum-based oxo-biodegradable plastic. Apart from this, paper bags or biodegradable bags can be used for daily purposes and industrial packaging material can be made from recycled material rather than custom made packaging. As it is said, nothing is impossible if all do their bit. So, for starters each one of us can start the change by reducing use of plastics on a personal level, like refusing plastic grocery bags, plastic bottles, food containers and other household items. Apart from that, we can encourage our neighbours and relatives to recycle the existing plastic so as not to add to the waste and rather use it again. Banning use of plastics outright is a very drastic measure that we cannot afford at the moment due to lack of alternative options. Even if it is banned, it might result in illegal manufacturing, use and disposal of plastic material which might further add to the problem as there will no longer be any rules and regulations to follow as plastic itself will be contraband. This might put plastic as a form of black-market business which will be quite hazardous to the environment. Various global initiatives have been taken to tackle the problem of plastic waste solution. One of these is the Clean Seas Campaign started by the United Nations and is being supported by several sports events in form of sailing, yachting and surfing to raise awareness. Apart from that, several businesses have taken initiative to give parts of their income to help clean the oceans of plastic waste. Moreover, a lot of celebrities like Leonardo DiCaprio and Mark Ruffalo have spoken up about the degrading environment and set up foundations to help tackle the problem at some level. Plastic has become sort of a necessary evil in our lives. But continuing to harm the environment is no longer an option. If we want to move forward from plastics, it has to be done in steps. It is something that needs to happen gradually no matter the urgency of the situation. Industries engaged in recycling of plastics and putting the material to unharmful uses should be encouraged. Recently Hindustan Unilever has launched the process of plastic disposal & recycling leading to no adverse impact on environment. What we can ensure nonetheless is minimal use of plastics on a personal level and at the same time moving towards greener alternatives on an industrial and global level. The first step being enforcing stricter recycling laws and banning low quality plastics. Next, we can concentrate on greener methods that can substitute plastic which will not cause the consumers much discomfort. Because without providing an acceptable alternative for plastics, if plastic is banned, it is more likely to result in illegal marketing and disposal of plastics which will only harm the environment further.